Once again, Kids Day Out at Dapto Ribbonwood Centre was a huge success. We organised 16 workshops and 12 presenters including authors, illustrators, poets and story-tellers. The new online booking system helped the day to run very smoothly and all workshops were well attended. The drop-in 'Story Festival' held by Dapto Library, with a photo booth and reading tent, was also very successful. We estimate over 150 children attended the day and received very positive feedback from parents and children. Thanks to all the committee members, Dapto Library, Dapto Ribbonwood Centre, authors, illustrators and poets who presented on the day. Thanks also to all the parents, grandparents and friends who brought children along. Over 80 guests enjoyed a wonderful evening at the Villa DÓro on Wednesday 13 June. The theme this year was steampunk, in honour of our special guest speaker, Richard Harland. Richard entertained us with a reading and tales of how he first started writing and how he continues to be inspired. Every table had a steampunk name and each table's mission for the evening was to come up with an amusing explanation for their name. We received so many generous donations for our raffle, and the evening was a huge success. Thank you to all who came along and supported the Illawarra South Coast Sub-branch Fundraising Dinner. We had over 200 children aged 3 - 13 at Kids Day Out, in the Dapto Ribbonwood Centre. What a busy day, with 12 talented authors and illustrators performing, lots of craft, writing and drawing, drama, reading and storytelling. Thanks to all who contributed, and to the parents, friends and grandparents who brought children along. What a fantastic day at the 9th Illawarra South Coast Literary Lunch on 9th August in Wollongong with 17 schools and 17 authors! Edwina Wyatt and Christopher Nielsen gave a sneak preview of their lovely new picture book, Ponk! and students LOVED the illustration/animation workshop with Adam Murphy. Everyone enjoyed working with their authors/illustrators to create stories, poems and more. Special thanks to Sally Hall for brochure design - and all the work by ISC CBCA Committee! Thanks also to the wonderful authors, illustrators teachers and librarians! We held our annual dinner at Villa D'Oro, Wollongong, in June. Everyone enjoyed the presentation by local author and editor, Sue Whiting (pictured below). Our theme this year was 'The Incredible Illawarra' and we all had fun coming up with 'true and false' facts about the region. Thank you everyone who attended, and for supporting our raffle - it was a huge success this year. Thanks also to our committee members for their hard work in the lead to this event, and also the generous organisations and individuals who donated prizes for our raffle. The proceeds raised will help us to continue important CBCAevents and programs in the local region, including the Literary Lunch for primary schools and author visits to high schools. The Illawarra South Coast Sub-branch Kids Day Out was held at Dapto Ribbonwood Centre and Library during the January school holidays. Fourteen authors/illustrators/performers entertaining children from early childhood through to upper primary. Activities include story-time, rhythm and rhyme, creative writing, poetry, publishing, comedy and craft. Sponsors include the Illawarra South Coast Sub-branch of CBCA NSW, Dapto District Community Centre and Library and BlueScopeWIN Community Partners Program. Thanks to our volunteer committee and the authors/illustrators/performers who helped make the day a huge success. 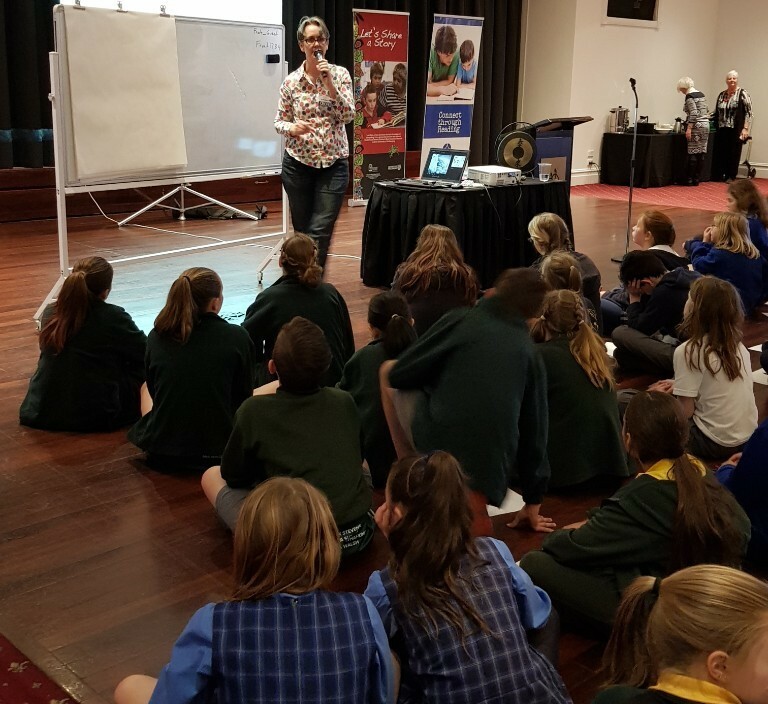 The Illawarra South Coast Sub-branch held its 8th Literary Lunch in August with 120 students from 16 local primary schools attending, along with teacher librarians. Children’s book creators, including authors and illustrators, sat with each school sharing their talents and experiences with students over lunch. Following a speed pitch session, where authors and illustrators promoted their books, students collected autographs in the 2016 keep-sake program. Internationally acclaimed illustrator, Tony Flowers, led a workshop captivating children with his incredible drawings, wacky humour and imagination. Students left with a bundle of books for their school library, as well as fresh inspiration to read, write and draw. Tony Flowers with Illawarra South Coast Sub-branch Committee Members: Jane Pretty, Julie Telenta and Demelza Haines. Our Annual Fundraising Dinner was held Wednesday 8th June at Villa D'Oro in Wollongong with guest speaker Libby Hathorn. It was a fabulous evening with over 130 guests, amazing raffle prizes, a dog-barking competition and much more. The Primary School Literary Lunch gives students the opportunity to have lunch with authors, illustrators and storytellers from across NSW. Participating schools send eight children and one teacher to the lunch. Each school party is seated with a guest author/illustrator, enabling students to gain first hand insights into the world of stories and books. The day also includes a presentation about reading, writing, illustrating or storytelling by one of the well-known guests. Flyer: The 2015 Illawarra-South Coast CBCA Primary School Literary Lunch flyer can be downloaded here. We are feeling very proud of our efforts with the Annual Fundraising Dinner held on June 10. We welcomed 163 supporters to dine and listen to Ashley Hay give a most interesting address on authors who influenced her from early childhood. Ashley wrote the successful book The Railwayman's Wife. Originally from Wollongong, it was great that Ashley's local family and some of her old school friends could join us. The KDO was an outstanding success with approximately 300 registrations to the various sessions throughout the day. There were also scores of under 5's who enjoyed the Fairy Playtime and reading tent kindly lent by Paint the Town REaD. had registered and those waiting nearby. Younger readers were keen to participate in craft which illustrated the stories which the authors read. Some tried their hand at writing poetry with great results. They showed their handiwork with great pride. write and illustrate. They then put some of the theory into practice and went away full of new ideas to begin the school year. On a lighter note a hall filled with children and parents enjoyed jokes and play reading.There was also a comedy workshop which was really well attended and a great success. enthralled with her stories. It was very heartening to see how much the adults also enjoyed the day. Many chose to stay close to their children and learn from the sessions. One grandparent said she had more fun than the children! The presenters for the day were Di Ellis, Di Bates, Wai Chim, Nathan Luff, Toni Brisland, Catherine Hanes, Claire Zorn, Jody Cauduro, Sharon Mc Guinness, Lilli Pang and Marie Smith from Early Childhood. We were pleased to have the Honeybees group led by Lynne Saad cater with their pop up cafe. The money raised goes to breast cancer research. Last but not least we were so fortunate to have the use of the beautiful Dapto Library and centre. It is a fabulous venue and staffed by the most helpful and co-operative staff under the leadership of Vicki Weir and Janelle Smith. We can't thank them enough. The primary school literary lunch gives students the opportunity to have lunch with 15 authors, illustrators and storytellers from across NSW. Participating schools send eight children and one teacher to the lunch. Each school party is sat with a guest, enabling students to gain insights into the world of stories and books. The day also involves one of the well-known guests presenting an engaging workshop about reading, writing, illustrating and storytelling. Guests had a fantastic time at our Annual Fundraising Dinner. The dinner was held in the main function room at the Villa D'Oro, Wollongong, on Wednesday June 11. Guests tucked into a three-course dinner, whilst listening to author, and comedian, John Larkin. Funds raised at the dinner help support our work in bringing books to children and young people in the Illawarra and South Coast region. The 2014 Kids Day out was held at Thirroul Community Centre on Thurday 16 January, 2014, between 10am and 4pm. "A fabulous day - well organised, fun, interesting and engaging - a wonderful venue." "Thank you so much. We travelled from Sydney to attend the event last year and loved it...so it was terrific to be able to attend again this year. The trip from Sydney was well worth it - a fantastic day - Thank you all!" Photo: Nathan Luff shares writing tips and funny bits! Special thanks to Lilli Pang and Bill Condon for a wonderfully entertaining evening.